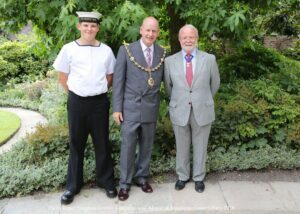 Maidstone sea cadets enjoyed representation at the Mayor of Maidstone’s Garden Party and pictured to the right of Mayor Cllr David Naghi is Deputy Lieutenant Mr Bill Fawcus DL, representing the Lord-Lieutenant at the event. The Mayor of Maidstone, Cllr David Naghi, held a garden party at Turkey Mill, Maidstone, for representatives of his chosen charities, and guests who are supporting him with his community efforts. Funds raised on the day went to West Kent Befriending Service, The Princess Project, Maidstone Sea Cadets and Snowflakes.